JOHNSON’S® Hand & Face Wipes were designed to gently and effectively remove dirt and germs from baby’s hands and face anywhere, anytime. Made with their NO MORE TEARS® Formula, these wipes are as gentle to baby’s eyes as pure water. 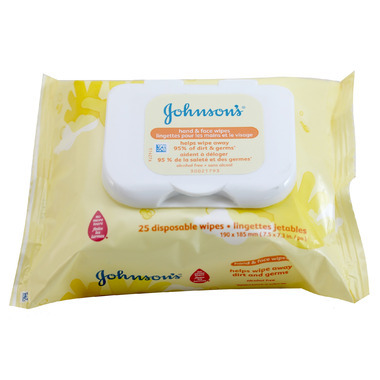 How to Use: JOHNSON'S® Hand & Face Wipes provide gentle on-the-go cleansing for baby’s delicate face and hands. Discard after use. I love these wipes - how compact they are and sweet smelling. I know that they are gentle on my little one's face but strong enough to tackle the mess on his face. These wipes do a great job of cleaning up messes on hands and face, but I wish the scent wasn't so strong! To my nose they are quite perfume-y and the smell lingers on my hands after a hand-washing. Hope it doesn't smell as strong for my baby. Going to try something unscented next time instead. A must have product for any mom's purse. I love the gentle scent of these wipes and the provide a hefty cleaning for their petite size. Ordinary baby wipes just can't do what these wipes do, and there's no greasy residue left behind like regular baby wipes. Plus the small size makes them a convenient option for "just in case" times when I don't want to carry a full bag of wipes on a quick trip out the door. My toddler gets more food around his mouth than in it and I love these wipes because they don't contain any alcohol so they're gentle enough to use on his delicate face and mouth. And they're strong enough that usually one wipe is enough to clean up the mess. My son's a messy eater, and after noticing his chin constantly breaking out and getting red from wiping with regular wash cloths, I was looking for something different to try. These wipes are perfect. They come out easily from the package, don't have an unpleasant or strong smell, aren't too wet to too try, and have a nice texture to them, to help wipe up the mess. The only downside is they're expensive.